Saint Patrick's Day is just around the corner and PetBling.ca has some terrific dog id tags to help your lucky puppy celebrate in Irish style! Four-leaf clovers are a universal symbol of good luck and our Rockin' Doggie four-leaf clover id tag is sure to give your dog an extra dose of good luck this year! Rockin' Doggie id tags are handcrafted in the U.S. from lead-free pewter. The four-leaf clover is slightly raised and the background is glittery green. This tag can accommodate two lines of engraving. Custom engraving is always free at PetBling.ca! Your dog would also look fabulous wearing a beautiful Irish Flag bone shaped tag. PetBling's Irish Flag tags are imported from the UK and are made from stainless steel. The green, white and orange painted sections are slightly recessed for a more high-end look! Three lines of engraving are available on this tag. 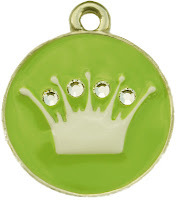 Your little leprechaun might also choose a glorious green id tag to celebrate Saint Patrick's Day. 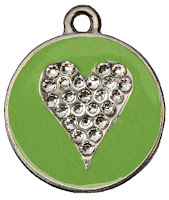 These designer id tags are handcrafted in San Francisco from lead-free pewter and feature clear Swarovski crystals. They can accommodate either 2 or 3 lines of engraving. Whether your dog is Irish, or wishes he were, our id tags are perfect for St. Patrick's Day and for every day!